Will the cicadas kill my trees, shrubs or flowers? The primary focus of this article is 17 and 13 year cicadas (Magicicada). Most other cicadas are nothing to worry about, with some exceptions1. People ask: “Will the cicadas kill my trees, shrubs or flowers?” The short answer is “maybe”, particularly if your trees are pathetic weaklings. Here are some ways to defend your trees, other than chemical warfare. First, it is important to mention that cicadas do not cause damage to plants by chewing leaves like other insects do, such as caterpillars. These are not the locusts associated with destroying the entire food supply of nations, nor are they the locusts mentioned in the Bible. Damage from cicadas occurs during ovipositing, or in some extreme cases, when they feed on the roots of trees4. The weakest limbs of a tree are often temporarily damaged or killed off, the result of which is called flagging, as the leaves of the branch will turn brown and look like a hanging flag. In many cases, they are doing the trees a favor by pruning their weakest branches. Cicadas are technically parasites of the trees, and they need the trees to survive throughout their life cycle, so killing trees is not in the cicadas best interest. If cicadas were tree killers, there would be no trees, and no cicadas left. Deciduous trees, like elm, chestnut, ash, maple, and oak, are the preferred host trees of periodical cicadas. They will flag the branches of these trees, but only young ones are at risk. Don’t believe me? Read this quote from the paper Periodical Cicada (Magicicada cassini) Oviposition Damage: Visually Impressive yet Dynamically Irrelevant by William M. Hook and Robert D. Holt (Am. Midl. Nat. 147:214-224). 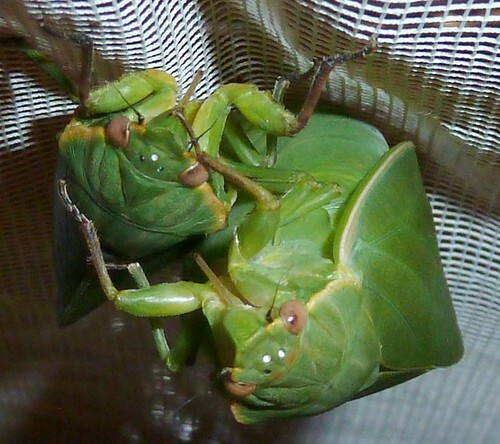 The widespread oviposition damage from periodical cicadas did not have any important effects on successional dynamics of the host plants, suggesting that the trees appeared to compensate sufficiently for physiological damage during the emergence. Periodical cicadas avoid evergreen trees for egg laying because the sap interferes with their egg nests. Fruit trees: Farmers expect every branch of their fruit trees to yield fruit. They will not tolerate ovipositing & flagging by cicadas. The smaller species of Magicicada, ‘cassini & ‘decula, like ovipositing on trees on the edge of a forest, probably because their offspring will be more likely to find grass roots when they leave their egg nests (cicadas initially feed on grass roots until they are big enough to reach and feed on the larger rootlets of trees). An orchard is all “edge of a forest” because of the rows between the trees, so it ends up being what the legal system would call an “attractive nuisance” for cicadas, because the farmers are baiting the cicadas by providing the ideal egg-laying environment, only to kill them with pesticides. Another consideration is that many fruiting trees are not native to North America. Apples, for instance, are from Asia and are not prepared/evolved for the egg-laying behaviors of cicadas. Small or Ornamental Trees: Cicadas pose the largest threat to small, weakling, ornamental trees, and young deciduous trees. These trees will have the fewest branches, and will not be able to suffer a heavy loss. These are the trees you can worry about, but there are ways to defend them. It makes sense to avoid planting ornamental, fruit or or other deciduous trees the year before and of a cicada emergence — make it the year you concentrate on pavers and low, ground-covering plants like vines and pachysandra. Shrubs, Vegetables, & Flowers: Given a choice, cicadas will avoid ovipositing on shrubs and long stem flowers, but if the emergence is particularly heavy, they’ll give it a try, out of desperation. Small flowers, like marigolds, pansies and zinnia will have the best chance of avoiding cicada egg-laying behavior since their stems are so short and unappealing for egg laying. I’ve experienced the full duration of two emergences of Brood II. During neither event did I witness the loss of a small tree, shrub or flowering plant. 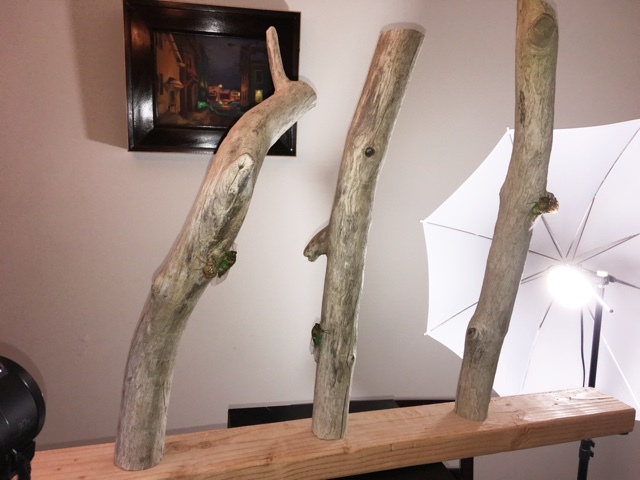 I saw a dogwood tree withstand two emergences, although it did experience ovipositing on nearly every stem, and it lost multiple branches due to flagging. In 1996, our small ornamental red maple withstood the cicada emergence without memorable issues (that plant was lost to a fungal blight many years later). I cannot remember any damage to scrubs such as boxwoods and forsythia, or garden flowers. Your personal experience might be different. And of course: Good Luck! 1 Certain cicada species in Australia will damage sugar cane and grape vines, but not in North America. 2 Periodical Cicada (Magicicada cassini) Oviposition Damage: Visually Impressive yet Dynamically Irrelevant by William D. Cook & Robert D. Holt. American Midland Naturalist, Vol. 147, No. 2. (Apr., 2002), pp. 214-224. 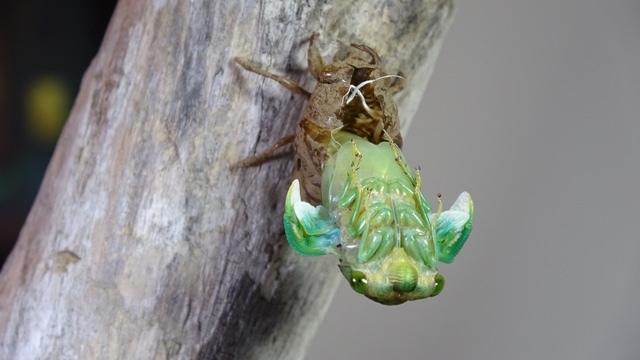 3 Spatial variability in oviposition damage by periodical cicadas in a fragmented landscape by William M. Cook, Robert D. Holt & Jin Yao. Oecologia (2001) 127:51–61. 4 Periodical Cicadas in 1963, Brood 23 by D.W. Hamilton & M.L. Cleveland. 1964. Proc. Indiana Acad. Sci. for 1963, 72; 167-170. Here are two videos of Magicicada septendecula from Brood II. Magicicada septendecula from Cicada Mania on Vimeo. A female Magicicada septendecula ovipositing from Cicada Mania on Vimeo.